This idea suddenly came when my friend asked me to make a cake for her daughter’s 4th birthday party. She asked me to make it the simple one. So, I choose to use her invitation card as the idea. 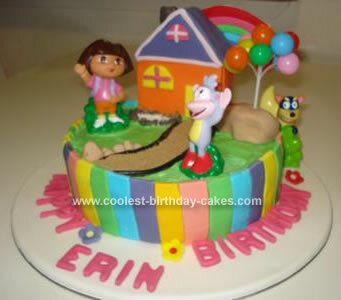 The cake’s story is about Dora and Boots wanted to go to Erin b’day party, without realizing that Swiper is sneaking behind the balloons to ruined the party. I used 22″ round cake tin with vanilla flavor for the Dora and Boots cake, and I combined between butter cream for the top with a little bit green leaf icing color, and ready icing for the rest. And finally, I put Dora, Boots and Swiper (From Fisher Price)as a topper. For the house, I was used a little rectangle cake tin, and I made small square and triangle cake. Then I covered with the orange ready icing and purple for the roof to get a contrast color. The result was so amazing.. everyone loved it.